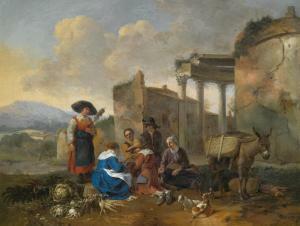 Find artworks, auction results, sale prices and pictures of Hendrick Mommers at auctions worldwide. 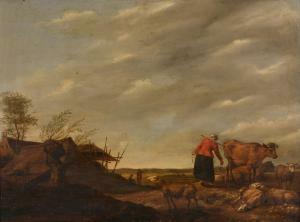 Hendrick Mommers (Dutch 1623-1693) Landscape with a milkmaid Oil on panel 48 x 65cm (19 x 25 1/2 in.) Oil on board. Surface dirt and dirty varnish throughout with some light staining. Areas of light craquelure, scattered throughout. Two scratches to the surface each approximately 10cm, one to the lower centre, one to the upper right corner. Two crack to the panel, the largest approximately 6cm both located to the lower left edge. Some light rubbing and associated loss to the framing edges. Inspection under UV light reveals a cloudy green varnish. However, no evidence of repair or restoration. By whom sold to Modzrejewsky, Amsterdam in the early 1940s. 85.2 by 101.3 cm. ; 33 1/2 by 39 3/4 in. Sir George Houstoun-Boswall, 2nd Bt. (1809-1883), Blackadder, Berwickshire, by whom probably acquired in Italy, circa 1847, as by Giovanni del Vite, and by descent. Enclosed with this painting is a certificate by Walther Bernt (1953). He refers to it as \“an excellently preserved, characteristic and very beautifully composed work of Haarlem\’\’\’\’s Hendrik Mommers\”. 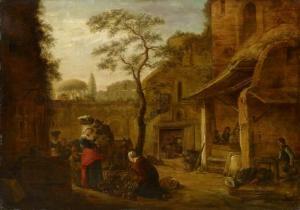 A comparable work of Mommers\’\’\’\’ is preserved in the Musées Royaux des Beaux-Arts in Brussels. 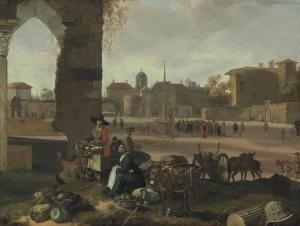 Italian Market Place Scene. Remains of a monogram on the stone in the lower left part of the work: Oil on oak. 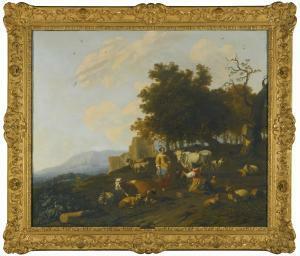 46 x 66cm. Framed. - Ernst Buchner, M├╝nchen Pasing, from 23.6.1950, available as an original.